Traditional Approach + Modern Technology: The easiest, most enjoyable, most effective way to learn any instrument is with the personal guidance of a teacher who's already developed the skills you want to learn. That's the time tested way to study music, and it works. Musiclessonz brings that method up to date, in a setting that's more convenient and effective than traditional lesson studios. Online lessons work the same way as sitting in the studio with your instructor - you see, hear, and talk with your teacher in real time - it all just happens in your web browser. For clients of all ages and skill levels, it's already proved itself to be the best way to learn an instrument. Meet live and in person with an online private instructor - our lessons are not prerecorded videos. Online lessons provide the exact same personal interaction offered in traditional music studio lessons, with convenience and educational benefits that are unbeatable. The Musiclessonz professional teaching staff and the unique Musiclessonz video-conference software provide a revolutionary new way to learn how to play guitar, bass, keyboard, and other instruments: See, hear, and talk with a teacher in real-time audio/video lessons. Meet face-to-face, ask questions, share written music, watch your teacher demonstrate and explain, and then get personal help learning every movement and concept in detail - just like in a traditional private music lesson. The only difference is that it all happens directly in your web browser. Record the video and audio of your lesson, and practice with it over and over again - there's no better way to learn. Because online lessons are more convenient, online students typically miss fewer appointments. That leads to greater consistency in the learning process, and it's ultimately better for the student. Music lessons often get in the way of obligatory events, rescheduling is difficult, and like other extra curricular activities, lessons are typically the first thing to get cut. Those disruptions often cause enough frustration for students to quit entirely. Our online students rarely miss their lessons. In contrast, our very own local studio students typically miss an average of 1 lesson a month due to travel difficulties (bad weather, schedule conflicts, car trouble, etc.). You're more likely to keep lessons moving at a comfortable, consistent pace when travel isn't involved. Young students concentrate better online - the distractions and insecurities caused by uncomfortable surroundings in a commercial lesson studio are dramatically lessened online. Shyness disappears to a large degree when young students learn in the comfort and safety of home, and more effective work gets accomplished (this is true for teenagers and adults too). Online lessons are still just as fun, personal, and lively as lessons in person - they're just more comfortable at home. Close-up shots with the camera clarify hand position and movement. Our students say the camera works better than in-person demonstrations - even better than having a teacher move their fingers in person (the teacher camera can get within 1/2 inch of fingers to clarify every detail of position and movement - in person, students never get that close). Often, the video is easier to watch, and your instructor can control what he wants you to see, with greater clarity and focus. Online lessons allow you to choose from a large group or exciting professional teachers from around the country. Musiclessonz.com staff grew by 18 teachers last year, and many of those instructors prefer to teach only online - that trend is just beginning! ... and taking lessons online is easy - if you can browse the web, you can run the lesson software. It's no more difficult than going to your favorite web site and reading the daily news. You see, hear, and talk with your instructor, just like you would in person - and it all happens right in your web browser. Setup typically takes only a few seconds, and requires hardware that most people already have (walkman style headphones, a computer mic, and an optional web cam - if you don't have those things, they cost about $30 total, and are available at just about any local store that sells consumer electronics). The software runs on just about any Windows computer with an Internet connection. Don't take our word for it. Try a Free demo, and see exactly how it works. New visitors typically don't believe it's possible to take effective music lessons using online videoconferencing software (especially when it comes to children...). Everyone is skeptical beforehand, but musiclessonz.com has many happy customers of all ages and skill levels who have learned to play an instrument online. The online process is completely natural and it's not a tradeoff - it's just as personal as working with a teacher in the studio, and in many ways more effective (see the testimonials). But don't take our word for it... See exactly how it works and judge for yourself. It only takes a few seconds to download the simple software and talk with an instructor. You'll get a free private demo with one of the available instructors - it's quick, easy, and completely free. Try it now by scheduling an appointment at the bottom of this page. 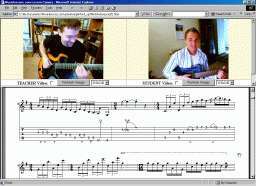 "I like this much more than taking lessons in person. I never liked driving to lessons, and either way, this just works out better for me. Having recorded videos of my lessons is the best part about it, and that alone makes the online setup much better than meeting in person. I practice with my videos all week long, and I've got a custom collection of every single example I've ever learned, tailored for me personally - that beats normal lessons hands down. It's easy to go back and review anything I want, whenever I want. I get all my questions answered each week by my teacher, and he shows me anything I want to learn. My old teacher didn't have the resources to do that in his studio. (He spent half the lesson writing out tab by hand each time). I feel much more comfortable learning at home, and I don't miss a single thing about meeting with a teacher at the local studio. The live video and audio is more effective than when my instructor showed me and moved my fingers in person - the close-up video makes things much clearer. I'm learning much faster at Musiclessonz.com, and I'm looking forward to lessons each week and enjoying playing much more than I used to." REQUIREMENTS: A microphone, Internet connection, and a PC with Microsoft Windows is required. For fast video, a broadband Internet connection is recommended (DSL, Cable, T1, or faster). 56k dialup connections do provide good sound quality, but slow video rates. You should have an inexpensive microphone headset to take ongoing lessons - sessions may be tried without any special equipment, but a web cam will allow your teacher to see your hands (that's NOT required). Web cams and headsets are available at Kmart, Target, Best Buy, etc. for less than $20. (* You will be able to see your instructor even if you don't have a camera). Click here for technical help and instructions. Musiclessonz.com has worked in depth with students of all ages and skill levels from all over the world. Most students actually prefer it to meeting in person. The setup is not just for adults - in fact, a majority of the musiclessonz.com students are children and teenagers. Parents love online lessons because they typically save at least an hour of travel time each lesson. Children tend to concentrate better when taking their lessons online - there are fewer distractions, and the interface is instantly intuitive and natural for young children (and for adults who aren't typically comfortable around a computer). Also, the lack of qualified local instructors no longer poses problems for students in rural areas. Musiclessonz.com instructors include teachers with Masters and Phd degrees in music, as well as experienced performers teaching beginner to professional levels in every style of music. A broad range of top notch instructors from around the world, a simple online interface, and a state of the art music instruction method have combined to provide benefits that aren't possible in traditional lesson settings. The hype and sizzle promised by Instant-Learn books, CDs and DVDs don't provide personalized ways of learning that are as thorough or as natural. Online lessons are perfect for students who can't make it to local lessons each week. Many of the original musiclessonz.com students intended to try online lessons temporarily because of hardships that made coming to lessons inconvenient or impossible (bad weather, scheduling conflicts, car problems, etc.). Virtually everyone who's tried it has continued online because it's simply more effective, fun, comfortable, convenient, and better all around than lessons in person. That's been true even for local students who're able to come to the musiclessonz studio - children, teenagers, and adults. Everyone initially assumes that it can't possibly be as natural as meeting in person, but it is. Teachers and students work comfortably together online and interact in a way that's just like being there. Students have taken thousands of lessons online and have seen just how effective it is. 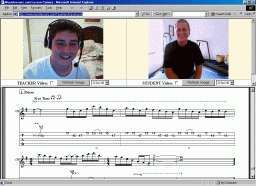 Real Lessons with a Real Instructor: Get real interactive music lessons, live on the Internet with a private music instructor - not prerecorded videos or text lessons. Using your microphone (and optional web cam), your teacher will work with you personally, using live, full motion video and sound to show you exactly how to perform every movement and technique. Using the highest quality audio/video equipment, he'll show you 1-on-1 how to position and move your hands and fingers, help you work out technical problems, and answer questions in real time. You'll see your instructor in vivid detail, and he'll help you learn with the same personal attention you get in traditional music studio lessons. Prerecorded videos and text lessons simply don't provide that sort of individual guidance. You do not need a webcam to take lessons! All our teachers are trained to work with their students whether or not student cameras are available. You will see and hear your teacher whether or not you have a webcam - no special equipment is needed. All Styles, All Levels: This program was created by an experienced instructor with a masters degree in guitar performance and 19 years of professional teaching and performing experience in virtually every popular style of music. The approach is fun, entertaining, and nothing like boring, confusing traditional methods. 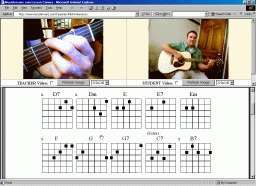 Learn to play quickly and easily, using music you like and want to practice. Learn each technique and concept, from the fundamentals to the most advanced skills, using a personalized approach based on the music you choose to play. Take lessons that are as satisfying as you'd hoped they'd be - enjoyable, exciting, productive, and progressively effective, from absolute beginner through professional levels (click here for more info about the teaching approach). Record Your Entire Video Lesson: In addition to working with your instructor live, you can instantly receive video and audio clips recorded in real-time, so that you can save and review parts of your private lesson repeatedly while you practice during the week. That's an extraordinary benefit that you don't get in typical music studio lessons. Instead of taking home a page of music to study, you'll be able to watch parts of your live video lesson over and over again in detail, until you've learned it. 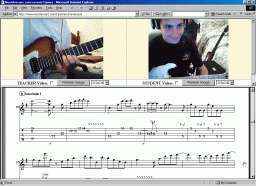 Free Music: Starting with your first lesson, you'll get instant access to thousands of popular song titles and written lessons which you can download immediately. All sheet music and tablature is sent electronically, and can be printed out in commercial quality for easy study (printing is not required - you can view all music on screen if you prefer). Inexpensive: Regular weekly sessions range from $14 to $25 per 1/2 hour, depending on the teacher you choose. That's less than the national average rate for music studio lessons. Save Time and Frustration: Skip the hassle of traveling to your local music store for weekly appointments. Save time and energy, and study effectively and conveniently at home with an experienced private instructor. Use the saved time to practice :) Parents take note - our clients love the time and trouble online lessons save each week! To begin online lessons, you'll need to set up an appointment. If you haven't already scheduled a lesson, please use the form below, or call 215-860-7625. Once you've confirmed a lesson time, you'll be sent instructions to download and install the software. The program is very easy to use, and technical assistance is provided if you have any problems setting it up. The instructor delivers all lesson video using a high quality, wide angle optical camera and a digital capture card, so that you receive the best video possible. Click here to see images taken directly from the instructor's camera. The instructor's voice and instrument sounds are processed separately and mixed directly into the conference software, so that everything you hear is crystal clear. Your instructor will put together a personalized lesson program and send you high quality printable sheet music and tablature for the music you want to learn. For you, it's as easy as can be - just hook up your microphone, headphones, and optional web cam, and connect to your private lesson online. (It's possible to take the lesson without a camera of your own, but if you do that the instructor will not be able to see your hands. Our teachers are all trained to work without seeing the student. You do not need any special hardware to watch the instructor, and most students start taking lessons without a camera on their side). Virtually any modern home PC with an Internet connection can be used to take the online lessons. The conferencing software runs on most versions of Microsoft Windows (95/98/ME/XP/PocketPC), and is very easy to use. You will need a microphone and a simple set of headphones (the typical Walkman type is usable, but a microphone/headphone combo is preferable). If you want to use a camera, a Logitech "eyeball" camera, or any equivalent will do - they are available at any large office supply, electronic, or department store. Kmart, Target, Walmart, Best Buy, Staples, and Office Depot all sell easy to use webcams starting at $20. Headset microphones start at $10. NOTE: To achieve quality video and sound conferencing, a high speed, broadband Internet connection (DSL, Cable, T1, or faster) is required. 56k dialup connections may be attempted, but they are not recommended. Because the lessons are genuine private appointments with a live online instructor, an appointment time must be set for your personal interactive session. Please use the form below to schedule an appointment at your preferred day and time. An instructor will reply with an email and call by phone to confirm your private lesson. Your instructor will also provide any help you need to set up the video conferencing software. The cost for online lessons starts at $14 per half hour (depending on the teacher you choose) - that's less than the average nationwide music store rate, and you'll save additional money, time, and hassle by not having to travel to weekly appointments. Ongoing lessons may be purchased online using the convenient Credit Card / Online Check link on each instructor's lesson page. Checks and money orders may also be mailed, if you prefer. If you'd like to talk with an instructor by phone, you can set up an appointment by calling 215-860-7625 - it's quick and easy to get started, and there's absolutely no risk or obligation. Regular weekly lessons range in price from $14-$25 per 1/2 hour, depending upon the teacher you choose, but the demonstration is free! To schedule an introductory lesson, just fill out the form below. An instructor will call to schedule a private lesson time and send you everything you need to get started. All contact information is collected solely for the purpose of establishing a private appointment time, and will be kept strictly confidential. Thank you!